I didn’t tell him that for me, meatloaf reminds me of hunger. Of belly-growling pains that stab up from your abdomen into your throat. Of trying to fill up on a piece of white bread and a big glass of water, thinking you can fool your stomach and your body into feeling full. Of being poor. Of being helpless. Of being alone. My parents were very young when they met, just 19 and 20 years old. They were 20 and 21 when I was born, and like the majority of people in that age group, I don’t think they had an inkling of what life with a child really meant. My memories start fairly early, living in a cabin in rural Alaska, no running water, sled dogs, a creek out back. We moved around a lot. My father had trouble keeping a job and had the antiquated notion, even for the late 60’s, that my mother should be a homemaker. He made very little money, but insisted she stay home with me. My mom was not cut out to be a housewife. Sometimes I’m not sure she was cut out to be a mother. Did she love me? Of course. Could she deal with the baggage, sacrifice and just plain drama that goes along with becoming a parent? I don’t know. I think she was unhappy, moving from California to Alaska, marrying someone who turned out to be a different person than she thought he was, being alone all day with a baby, no one to talk to, few friends. I don’t remember anything especially bad about that time. What I do remember is her sense of restlessness, long walks through the woods that led us nowhere, nights where I’d find her staring out the window into the darkness. One morning, I woke up and she was gone. I was not quite five years old. My dad tried his best, juggling a small child and jobs that never paid quite enough. We moved again, this time to a tiny trailer on the edge of town. I think it was more of a travel trailer, because even to me at age five, it felt small. I was dropped at any babysitter who would take me and didn’t charge much, so he could work. I had sitters who ranged from kind, to indifferent, to downright abusive. It didn’t matter, because he was always going to the next job, sometimes working two part-time jobs to try to make ends meet. On Sundays, we would get up in the morning and sit at the tiny kitchenette. We had a black and white television, perched precariously on the counter, and I’d watch roller derby while he made that week’s dinner. 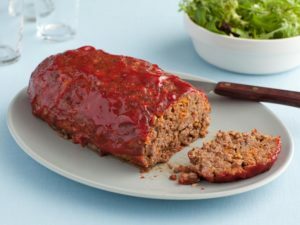 It was almost always meatloaf. Ground beef was cheap, and he could stretch it with some stale bread crumbs and a couple eggs. If we had milk, he’d add that too, trying to make it bigger, more filling. I’d watch him cook, watch him mix the ground beef with his hands, mouth watering even as part of me gagged at another week of meatloaf. He’d pat the meat into a pan, a circular dome of pink slime, mix up some ketchup and brown sugar (if we had it. If not, just ketchup) and pop it in the oven. We’d watch the rest of roller derby while it cooked. It was lunch. It was dinner. Sometimes on a Friday when we were really running low, it was breakfast. I’m sure he grew just as sick of eating it as I did, but it was one of the few things he knew how to cook, and it was a cheap, filling meal. Some days, that chunk of meat was the lone occupant of the refrigerator, congealing on a plate as I stared it down, hungry but loathe to eat one more bite. No matter what our situation was, my dad was too proud to ever ask for help. I’m sure he knew about food stamps, public assistance, programs to help single parents. But back then, a father raising his child alone wasn’t common. It wasn’t considered noble; it was considered odd. I think he was more afraid of calling attention to himself, to us, worried that child services might question a man living with his child in a run-down trailer with no heat, worried that he might lose me. Some days, my best meals were the ones that week’s babysitter served, a peanut butter sandwich on fluffy white bread, a glass of milk that was cold and fresh. Milk was a luxury to me, as my dad usually bought powdered milk and watered it down heavily to make it last. As a result, I never developed much of a taste for it and don’t eat dairy to this day. We moved out of the trailer early one morning, I don’t know what time it was, but it was still dark out. My dad bundled me up in the car, told me to go back to sleep. He said we’d drive to my grandmother’s house, 300 miles away in the Alaskan bush. I’m pretty sure he left on the fly, owing rent and unable to pay. He set a packet of tin foil on the console in between us before we hit the road. I already knew what was in it. We should’ve made it to my grandmother’s in one day, but the day stretched into a week, maybe longer. My father would stop and get gas, go to a pay phone. I could see him arguing with someone but I didn’t know who it was. I’d later find out it was my mother, wanting to see me, him refusing to allow it because he was angry and hurt about her leaving us. We slept in the car. We ate the last of the meatloaf. He bought a loaf of cheap white bread and we ate that, one slow slice at a time. We slept in the car. Eventually, we ended up at my grandmother’s, a place I loved because every meal involved meat, potatoes, peas, okra. She made gravy that was amazing, and she’d pour a heaping serving over homemade biscuits for breakfast. I was never hungry there, for food or affection. She would make sure I had something to eat, a coat to wear, a hat. She was practical and no-nonsense but always loving. There were no babysitters, and best of all, there was no meatloaf. We left my grandmother’s house when my dad met my stepmother and we moved back to town. My dad got a decent job and worked his way up, my stepmother was good with money and managed it much better than my father ever did. They became comfortable if not quite wealthy. She and I never got along and I left home young, figuring life out on my own just like I’d always done. I open the refrigerator and pull out a packet of ground beef. It’s the super low-fat high end stuff, not the gelatinous goo my dad used to use. I season it well with diced onion and garlic, adding panko bread crumbs and three large eggs. I create a lovely glaze made from fresh pureed tomatoes, brown sugar, Dijon mustard. I dig my hands into the meat, blending, mixing, combining memories of hunger and pain with the rich full life I enjoy now. I make meatloaf for my family with what I’m sure is the same love my dad made meatloaf for me. It’s different, and yet somehow, it’s exactly the same. A meal to fill your stomach, but perhaps not your soul. Bio: Jody Ellis is a freelance writer, screenwriter and author. Her work includes regular publication in trade and regional magazines, online content, copywriting, award-winning screenplays and two published books. Born and raised in Alaska, she has lived all over the state, currently making her home in Anchorage. She is a single mom to two, pet mom to several, and an advocate of building a voice for marginalized communities in Alaska.